Valentine’s Day is just around the corner, so to set the mood, here are a few of our favorite romantic designs to help you look like a superstar. Wow your flower aficionado with an abundance of blossoms – lilac, hellebores, hydrangea, roses, cymbidium orchids, and succulents gathered in a rustic cement vessel. Is your Valentine a glam girl? Surprise her with an exotic array of jewel-toned beauties! Amethyst vanda orchids, pink sapphire roses and orchids, and ruby red roses are accented by sparkling crystal accents and dressed up in a silver cube. A favorite among orchid lovers, cymbidium stems exude style when artfully accented with foliage, grasses, and willow. Sure to make her swoon! A decadent duo of luscious roses and fine chocolates is a feast for the senses! Dressed up in a luxe metallic cube, these roses en masse are as intense as your love. For the woman who’s colorful enough – our signature look of whites and greens takes on a romantic feel in a contoured glass vase. Hellebores, lilac, hydrangea, and lisianthus are quite lavish all on their own – no roses needed! This electric display will light up your Valentine! 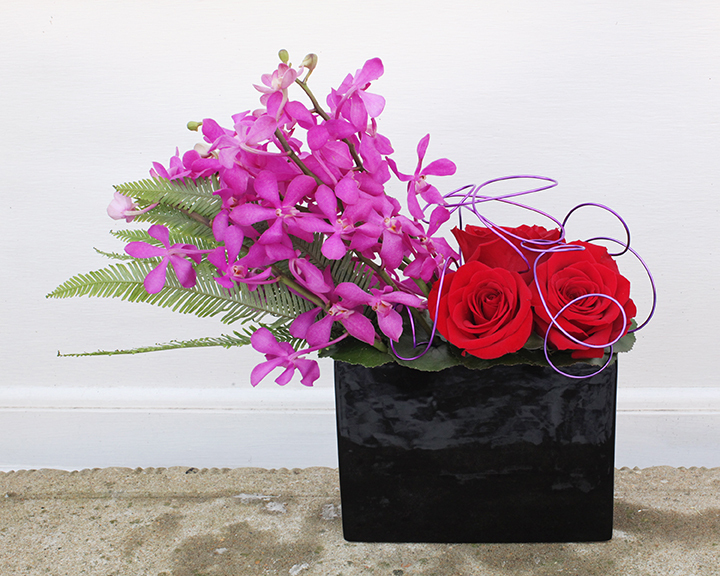 Featuring shocking pink mokara orchids, freedom roses, vibrant umbrella foliage and grape wire accents in a black glossy vase – this one’s not for the faint of heart. Our version of classic romance. A bouquet of tantalizing texture including roses, orchids, hydrangea, and ribboned foliage – all elevated in a bronze vase for added allure. Designed in a low chocolate cube, this lush grouping of ‘Cherry Love’ roses is perfectly sized for a desk or coffee table. Stems will be hidden and out of the way so that only the cherry red blooms will be on display! Does your valentine love roses, but not necessarily red? Our favorite sweet unique roses in bubble gum pink are a refreshing alternative to the traditional red.